In a stand mixer bowl, stir together warm water and honey until the honey has dissolved. Add yeast and stir to combine. Allow to rest 5-10 minutes until yeast is foamy. Turn the mixer on low speed. Gradually add flour, baking powder, salt yogurt and egg. Increase speed to medium-low and continue mixing the dough for 2-3 minutes, or until the dough is smooth. Remove dough from the mixing bowl and use your hands to shape it into a ball. Grease the mixing bowl with cooking spray, then place the dough back in the bowl and cover with a damp towel. Place in a warm location and allow to rise for 1 hour, until the dough has nearly doubled in size. Once the dough is ready, transfer it to a floured work surface. Cut the dough into 5 separate pieces. Use your hands to spread dough piece so it is flat and ¼ inch thick. Heat a large cast iron skillet over medium-high heat. Add a piece of the rolled-out dough to the pan and cook for 1 minute, or until the dough begins to bubble and the bottoms turns lightly golden. Flip the dough and cook on the second side for 30-60 seconds, or until the bottom is golden. Transfer the naan to a separate plate and cover with a towel. Repeat until all pieces of naan are cooked. In the meantime, preheat the oven to 400 degrees. Place carrots, zucchini/squash, cauliflower and chickpeas on a large baking sheet and coat with olive oil. In a small bowl, mix together oregano, cumin, paprika, coriander, turmeric, salt, black pepper and crushed red pepper flakes. Sprinkle over vegetables and toss to coat. Roast for 20 minutes, or until tender and crispy. Spread hummus on each piece of naan. 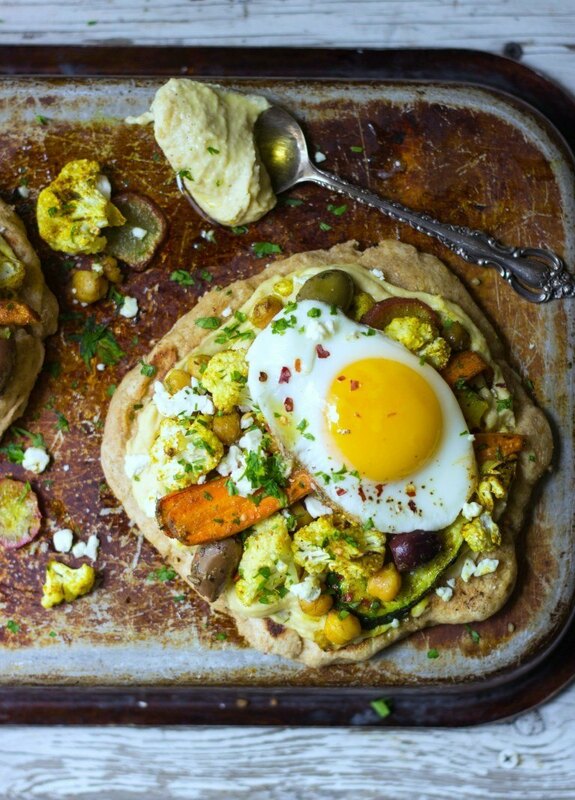 Top with roasted vegetables, olives, feta and fried egg (if using). Sprinkle with parsley and serve.